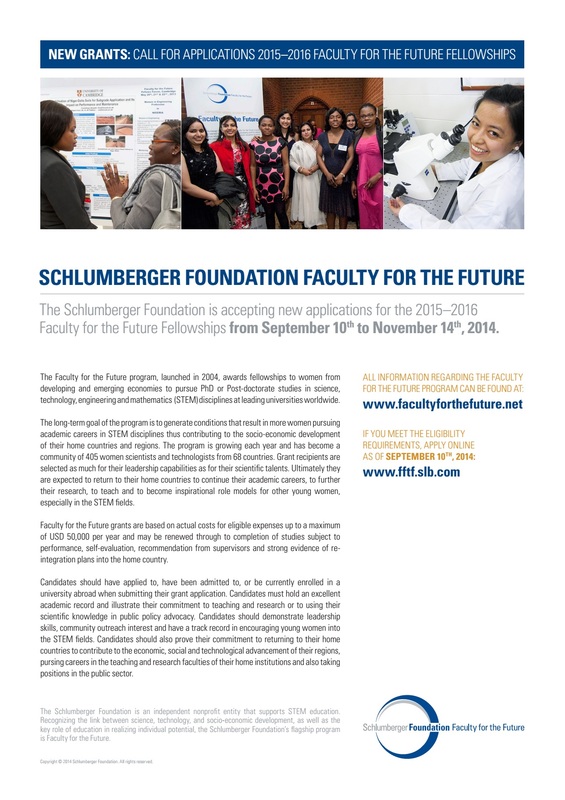 Last year (selection 2014) the Schlumberger Foundation Faculty for the Future program receiced 558 eligible applications. 84 of them received an award. Note: The Schlumberger Foundation reserves the right not to consider or further process applications from applicants whose country of citizenship and/or residence is a country under embargo. You are willing to contribute to the socio-economic development of your home country and region by strengthening the faculties in your home university, pursuing relevant research, or using your specific expertise to address public policy matters. Information regarding available funding from other sources (fellowships, scholarships, sponsorships…) should also be provided.